Thad is an Emergency Management practitioner with over 17 years of experience in The United States and abroad. He has worked in all segments of emergency services, from field operations to organizational policy formation. 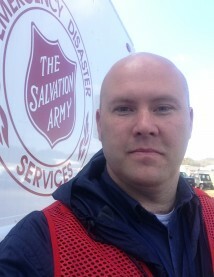 He currently serves as the Director of the Emergency Disaster Services for the Alabama-Louisiana-Mississippi Division of The Salvation Army. Thad was previously the Director of the Disaster Management and Relief program at Ohio Christian University. This program sought to integrate the field of emergency management with those looking to minister around the globe in a more practical way. Thad not only designed the bachelor’s level program, but wrote the entire curriculum, and directed it for 5 years. While no longer a full-time academic, he continues to consult and teach as an adjunct Assistant Professor within the Disaster Management program at Ohio Christian University, and The Emergency Management Department at the University of Maryland, University College. In addition to Thad’s other duties, he sits on the editorial board of “The Journal of Emergency Management,” a top tier journal in the emergency management field. He is the past Editor-in-Chief of two quarterly academic journals, “Trauma Healing” a professional journal focuses on the primary and secondary trauma of those working in professions surrounding suffering, death, and dying, and “Healing Ministry Journal” a journal focusing on emotional trauma from a Christian perspective. Thad is a Certified Emergency Manager, (CEM), and since receiving his MA from CJP, has earned a PhD in Intercultural Studies. Thad’s doctoral research centered on organizational culture and its effect on the way the groups carry out emergency disaster services within the United States.